January 28, 2011 by Ken Ward Jr.
Well, the rumors had been floating around for more than a month now that parts of the federal Office of Surface Mining Reclamation and Enforcement’s EIS on its stream protection rule had been leaked, so the story was bound to show up somewhere sooner or later … and Tim Huber over at The Associated Press got the scoop on it earlier this week. I’ve been out for a couple days and I’m just catching up on it, but I made sure to post a copy of Tim’s story over at the Gazette’s Mining the Mountains page, so it doesn’t disappear from our free Web site in a week or so. The Obama administration’s own experts estimate their proposal for protecting streams from coal mining would eliminate thousands of jobs and slash production across much of the country, according to a government document obtained by The Associated Press. The Office of Surface Mining Reclamation and Enforcement document says the agency’s preferred rules would impose standards for water quality and restrictions on mining methods that would affect the quality or quantity of streams near coal mines. The rules are supposed to replace Bush-era regulations that set up buffer zones around streams and were aimed chiefly at mountaintop removal mining in Appalachia. The office, a branch of the Interior Department, estimated that the protections would trim coal production to the point that an estimated 7,000 of the nation’s 80,600 coal mining jobs would be lost. Production would decrease or stay flat in 22 states, but climb 15 percent in North Dakota, Wyoming and Montana. OK … that sounds pretty bad, and it certainly fuels the “war on coal” cries from the National Mining Association and West Virginia Sen. Joe Manchin, both of whom were quoted in Tim’s story. But, the story didn’t describe any other details — such as over what time limit those jobs would be lost or what sorts of benefits OSMRE has quantified for its rule. Frankly, a common thread in Tim’s AP reporting has been to publish the estimated costs of rules — such as those being proposed by the U.S. Mine Safety and Health Administration — but not also publish the estimated benefits to society from those rules. And in this instance, AP did not make the document it obtained available to readers or its member news outlets online — so there’s no way for readers to really dig into what those figures mean. But heck, Tim had the scoop here, so it’s hard to blame him for not sharing the document with readers when doing so might mean AP didn’t have the story all to itself. Without additional context, there’s no way to understand what these numbers actually mean. By putting them out there in sensationalist terms without any way for anyone else to see the context and assumptions that went into them, Huber has done an enormous disservice to entire debate about protecting streams from the impacts of coal mining. And while reporting on leaked documents has a long and proud tradition, isn’t there some obligation to provide essential information needed to understand what’s reported about them? Of course, it seems that there were people outside federal and state agencies that already had their hands on the secret draft document because Huber provided a quote from the National Mining Association that could only have been made if they had already analyzed the numbers (wonder who leaked it to Huber?). Worse, Huber reported the NMA’s response without even contacting any supporters of a strong Stream Protection Rule to see if there might be different views on those numbers. Fair enough, Ken – my critique was closer to polemic and it was kind of puerile to boot. Admonishment accepted and my apologies to Tim Huber for going a little over the top. All that said, there’s a whole lot at stake here. And I just don’t think that using sensationalistic language to report out of context “facts” from a secret document that nobody else can verify and to quote NMA without seeking other viewpoints was acceptable journalism. The result is that, for any purposes other than NMA propaganda, the story had no real informational value whatsoever. And that’s what people need to know. Other than the coal industry folks who clearly have access to the document, none of the rest of us know anything useful about what OSM’s analysis said. That won’t stop people from jumping to conclusions, I’m sure, but because of how this was reported their is really nothing to base those conclusions on. Will AppVoices be including your apology on its Front Porch blog site, where folks who read the original piece would be sure to see it? Just wondering. It seems that would be a good place to start having a more respectful dialogue about these issues. So, does anyone thnk that OSM did not intentionally shoot itself in the foot to get out of its stream protection rule development (after spending hundreds of thousands on it)? If this is surprising to anyone, that is really surprising. With the Republican War on the EPA that is playing out now, it is more important than ever that the public understands the entire issue before we grab on to focus group honed catch phrases as the basis for our thinking… or our votes. Updated with apology, Ken – and thanks for being the angel on my shoulder. While environmental and community advocates are waiting to get access to what everyone in the coal industry already seems to have, I also want to emphasize something that was buried toward the bottom of my post. In the extremely unlikely event that OSM did an economic analysis that looked at job benefits as well as job losses, we need to look at job losses in one particular industry through the lens of a society that is progressing, not stagnant. Demand for Appalachian coal is declining at a jaw-dropping rate (betcha OSM’s analysis didn’t consider that trend) and so job losses are going to occur whatever EPA and OSM do. Even Arch Coal’s CEO Steve Leer readily acknowledges that fact. The real question is whether underground mining jobs are going to disappear before or after jobs at mines that destroy streams are eliminated. I vote for the latter. I have to wonder what “jaw-dropping” means. CAPP production is down and will likely stay that way, but there will be a leveling out of that drop before too long and then production will likely be fairly constant for many years. That’s especially true with respect to met coal. And, I must take issue with the comment that we must look at job losses through some sort of lens. There are no shades of lenses available that will put food on the table or keep the roofs over the heads of unemployed coal miners and their families. Nor will those in the coalfields who would lose their jobs because of the ripple effect of the loss of coal jobs (service workers, municipal employees, etc.) be happy with a new set of glasses. For them, this does not represent societal progression. Society has instead cast them aside. America is supposed be better than that. And please don’t talk about some sort of “just transition” unless you can demonstrate to me one instance — just one — where workers in an industry wiped out by government action (or inaction) or larger economic forces were able to stay in their communities and transition into new jobs that paid the same as their old ones, with the same benefits. Go take a look at the shuttered steel towns in Ohio, Pennsylvania and Indiana and ask the folks there how “just transition” and promised retraining for new, innovative worked out for them. Ask the retirees in the steel and auto industries who lost their pensions and their retiree health care how much they enjoy the progress of society. The economies in their towns have been repeatedly devastated by the steel and auto shocks of the last 30 years and they still have not recovered. Yes, let’s find out more about what this OSMRE memo really means. But let’s not approach this or any other discussion of mining jobs disappearing, underground or otherwise, with rose-colored lenses in our glasses. You raise important questions … and they’re worth talking about for sure. No question about it. 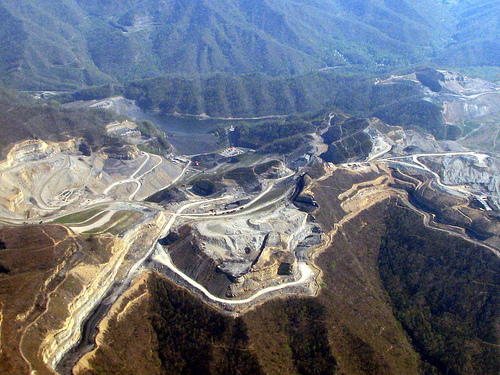 That’s a different issue, perhaps … but perhaps it’s worth cringing whenever someone says that doing something to limit the damaging impacts to the environment (and coalfield communities) from mountaintop removal will involve no economic pain for anybody … It’s hard to believe that could possibly be true. I’m not sure how Matt or you would define “jaw dropping” but the declines that are projected over the next 10-25 years are pretty large — 46 percent and 58 percent, http://blogs.wvgazette.com/coaltattoo/2010/01/19/must-read-report-the-decline-of-central-appalachian-coal/ . And, as you know, Phil, that’s projected regardless of whether EPA does anything about MTR and climate change. You perhaps rightly dismiss any sort of proposals to help the workers and families who might be affected by this, saying that other similar programs in other places and other industries haven’t worked. Without trying to argue the point, I would ask the United Mine Workers what it proposes to do then? 2. If something is done about MTR and climate change, it might make those impacts — almost certainly will make those impacts — worse for coal miners and their communities. Given No. 1, does it make sense to simply have our political leaders spend their time and effort yelling about No. 2? Or should somebody be trying to find a way to help the people who will be affected by No. 1? And if that’s the case, what’s the UMWA’s plan or proposal for that? Phil Smith — it’s great to see you pointing to other “job loss” situations and asking what we can learn from them –including job losses from technological change, cancellation of military contracts, globalization — the lot. Short-term “transitional” assistance, I am guessing and as you say, almost always plays out as not very effective in dealing with long-term “job loss” issues. However, some areas do rebound, like Pittsburgh, for reasons that probably don’t have much to do with “transitional” assistance. Unions have been big losers as a result of a lot of these “job loss” changes, one would have to say — and yet, unions are also consistently both realistic and creative in trying to make the best of a bad situation — unlike the capitalists, who simply move on, with as little accountability for their legacy as possible. There are no non-tragic “answers” to this dilemma. I consistently turn to two thoughts that might be helpful: (1) tax the heck out of existing coal production and use the revenue to create a world-class edcuational system for the children in the coalfields, so they have more options — even if it means moving away; and (2) get a price on carbon pollution and use a piece of that revenue for seeing how much coal production can be kept with CCS, and another piece for education, etc. The main point that you make, Phil, that I again positively respond to, is that if we really want to think today about how to best manage this difficult situation, we would do well to carefully look at what has been tried in other areas, and see what good ideas if any can be transplanted to the coalfields. The one “head in the sand” approach that I personally think is madness is to delay creating the incentives we need to reduce carbon emissions from coal burning — because that path is literally a sin against the future. Great discussion — note how many commenters are posting under their own names! Sorry, Ken, but as a child and teen in Western Pennsylvania I experienced the needless yet willful destruction of America’s steel industry first hand. I had friends whose families were destroyed and who have yet to recover 30 and 35 years later. And all the while well-meaning people said that if they would only learn to do something else, it would all be OK. I can’t stand by and watch that happen again. Not without speaking up, anyway. The UMWA has been and continues to work to address both #1 and #2. As you have pointed out in other posts, we were just about the only active participant from the coal industry who were PROACTIVELY involved in working to see to it that any climate change legislation included funding and a process for ensuring the future of coal. We did not get all that we felt needed to be done in the Waxman-Markey bill, so we could not in the end support it. But we got enough to make many in the environmental community condemn the legislation for being to friendly to the coal industry. The point of that is that with the kind of long-term investment in the commercial development of carbon capture and storage capacity called for in that bill — and mentioned by President Obama as part of his vision for a clean energy future just this week, there will be a market for CAPP coal and other Appalachian coal for decades. The amount of coal mined in CAPP will not be as great as in years past. But through our legislative activities we’re fighting to preserve the jobs of those who are members of our union. Finally, through the work of the UMWA Career Centers, we are just about the only entity around which does have real experience in training displaced coal miners for other, well-paying occupations. But we would much prefer that they stay in their coal jobs. By “jaw-dropping” I mean a projected 50% drop in CAPP production projected to occur between 2008 and 2014 by the EIA. But I agree that it will level out in the 100 million tons/year range and that met coal will be the ticket to maintaining a substantial coal industry in Central Appalachia for decades into the future. For my part, I think that’s a good thing, especially since the prices that met coal will command for the forseeable future allow for safer mines and bigger payrolls. But I will indeed point to an example of a specific transition that worked out well for most residents, which is the transition away from reliance on old growth logging in the Pacific Northwest two decades ago. I grew up in rural Washington and was very engaged in that controversy, starting with the spotted owl decision and ending with a plan to rapidly transition away from old growth logging while at the same time ensuring that the timber industry remained viable. I am continually struck by the similarities between that situation and the one with which we are confronted today. Did every logger find a job that paid just as much and provided the same benefits? I’m afraid not. But the economic situation for those communities as a whole improved, rather than declined. How did that occur? Ambitious and proactive job retraining and economic transition assistance provided at both the state and federal level. Included in that package was the opportunity for any logger to go to any two or four year college in the state for free, and a host of other opportunities for assistance for those who didn’t want to go that route. The biggest difference I see between the Pacific Northwest 20 years ago and Central Appalachia today is the political power of the industry. Timber had no small influence on Washington State politics, but West Virginia politics is absolutely owned by the coal industry. The result is that, instead of promoting ambitious policies to diversify the economy and bring new industries to the region, politicians like Rahall and Rockefeller appear interested only in promoting more profits for the coal industry, while jobs (and population) continue an inexorable decline. There are other options, but with the devastation that has been wrought by the coal industry, it’s not likely to happen through private enterprise alone. Central Appalachia is a lot like New Orleans, but our Hurricane Katrina occurred gradually over the course of the last 40 years. It’s not socialism to for government to lend a hand in such circumstances, it’s the right thing to do. It’s pretty easy for anyone to say that it will all be “OK” when they’re talking about someone else’s life, isn’t it? It’s easy to dismiss the loss of a job or benefits when it’s somebody else. My guess is that people who live downstream from mountaintop removal mines (even the few remaining ones that are UMWA operations) or even those who live near underground mines that cause subsidence or water pollution would feel the same way. I grew up in Mineral County, W.Va., where we watched many major employers disappear or shrink for a variety of reasons … Pittsburgh Plate Glass, Celanese, Kelly Springfield tires (where my uncle worked), even the Westvaco paper mill — Harvard scholar and fellow Piedmont native Henry Louis Gates writes much more eloquently than I ever could about fearing the day when some executives in New York decide to close the mill down. These are real concerns, as Sen. Byrd said. Sen. Byrd also said change is coming, like it or not. I wonder if you could provide Coal Tattoo readers more information about the UMWA Career Centers — my guess is most people here on this blog don’t know much about them. God bless you, Phil Smith. Coal miners in Illinois, like my grandfather, have learned the bitter lesson of the volatile market so many times over the past century. Perhaps a “just transition” to a sustainable economy in our coalfield communities is a pipe dream. Down in Saline County, my family members sure have a pipe dream about fishing again in our now sterile streams (from discharges). I agree with your demand that we need one good example of a “just transition”: I wish some venture capitalist would just open one–just one!–wind turbine factory that paid good union wages in Saline County (which despite its incredible coal mining wealth, ranks 98 out of 101 counties in unemployment, entrenched poverty and poor health) . The boarded up coalfield towns in southern Illinois now look at the luck of the good folks in Pike County, Illinois. A wind company plans to build a new wind farm there and create an estimated 600 jobs–isn’t that three times more than the total number of UMWA members currently employed in Illinois, or was the Springfield newspaper report incorrect? But considering that Vermilion County is the birthplace of strip-mining, which has led to a whole lot of destruction over the past 150 years, it sure seems like a just transition to a more sustainable future to me. Keep the faith, Phil. Whether a “just transition” is a pipe dream or not, I think we both hope our kids and grandkids will live in sustainable and vibrant towns with a diversified economy, surrounded by clean air and clean water….and beautiful creeks to go fishing in. Ditto the frustration for want of more details. I’ve been waiting with the proverbial bated breath for you to give us the skinny on this one, Ken. As soon as I saw Huber’s piece, I went looking in vain for the actual document (twice in the last two days). Good to know I’ve not lost my mind. The wire piece made for a good “gotcha” but leaves lots more lingering questions than it answers. Let’s have the whole meal, AP. Jeff Biggers: “visions” of “sustainable and vibrant towns with a diversified economy, surrounded by clean air and clean water….and beautiful creeks to go fishing in” are almost certainly as unrealistic as the similar “lots of coal jobs forever — made in America” pipe dreams set out in comments by another commenter here, “Bob the Miner,” about a week ago. Do pipe dreams (even admittedly unlikely ones) do much good? Or are they, possibly, basically form of denial, a classic reaction to tragic situations, where “justice” (however you define it) is impossible to achieve. We probably do better, in my view, when we expressly face the painful fact that we are confronting a tragic and inherently “unjust” situation — with negatives in every direction — and then we work to steer and manage that tragic situation in an open, democratic, and accountable fashion. Thanks for your response, I was aware of the economic transition in the logging industry but only peripherally. It’s interesting to read the comments of one who lived through it. As a friend of mine mentioned, however, I suspect that if you talk to one of the former loggers who didn’t find a job that paid as much or had the same benefits he would have a different view of that history from yours. And though I agree with the notion that it isn’t socialism for government to help people in need, I also wonder who, in 2011, would pay for the kind of programs you cite that occurred in Oregon? And I wonder what people will be retrained to do that would provide the kind of compensation they are currently getting? Finally, I also will say that it’s my view Sen. Rockefeller and Rep. Rahall are long-term friends and supporters not so much of the coal industry but more so of coal miners. There is no question Sen. Byrd fit that description as well. A look at Rockefeller’s and Rahall’s entire congressional record when it comes to the coal industry shows that there are no stronger congressional voices for miners, retirees and widows when it comes to their safety at work and their lives after their working days are over. Sen. Rockefeller sponsored and passed the Coal Act, which established health care for retirees and widows whose companies have gone out of business and Rep. Rahall developed the funding mechanism for it. They have saved and extended the lives of thousands upon thousands of retired coal miners and widows. That is more than commendable, that is meritorious service for which the UMWA will always be grateful. A little off topic there, sorry. Where do you live? In a city with the benefits of a diversified economy, or a small coal mining town with a single coal extraction-based economy controlled by an absentee corporation? And what gives you the right to condemn all coalfields communities to a “tragic and inherently unjust situation”? I find that offensive—to the fates and futures of coalfields residents, and to all Americans who believe in a just and democratic society. And I believe if you regularly read the comments section of Coal Tattoo — or had followed coal mining issues in West Virginia back a ways — you would know who Tom Rodd is and where he lives. He’s described it on this blog, and he’s done quite a bit to improve the conditions for coalfield residents in West Virginia. I believe Tom was simply describing — and accurately — the difficult situation that coalfield residents find themselves in. With that said, that’s about enough comments on this thread for the day. I’ll take the last word. Thanks everyone for their comments, and have a good weekend.